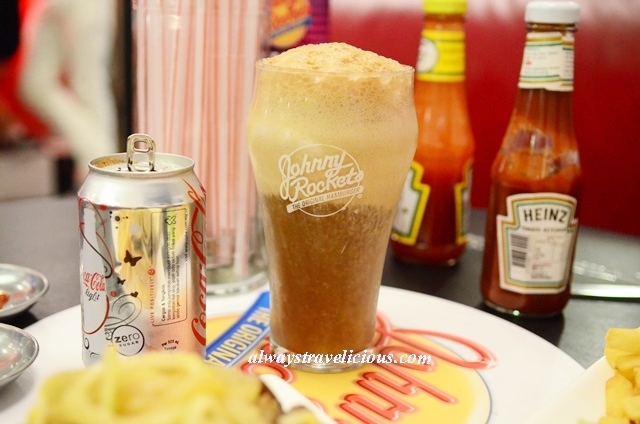 Johnny Rockets Malaysia @ The Curve, PJ - Always Travelicious ! 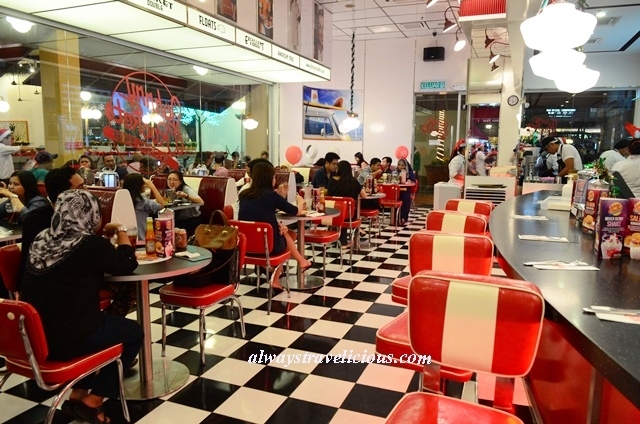 Johnny Rockets serves timeless American dishes like nachos, Philly cheese steaks, hot dogs, burgers and milkshakes while reliving the good old American Diners’ atmosphere where classic checkered floor in black and white and the red interior make a striking visual statement. 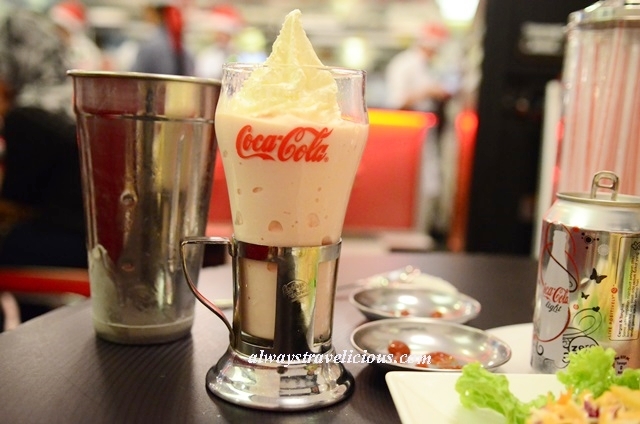 The drinks at Johnny Rockets are very old schooled like the strawberry shake (RM 15.90), which is quite frozen to start off but becomes mushy and creamy later on. I haven’t had milkshakes in a long time and it brings back childhood memories of drinking milkshakes (at McDonald’s) only during special occasions. The diet coke float (RM 9.90) is a fizzy delight. 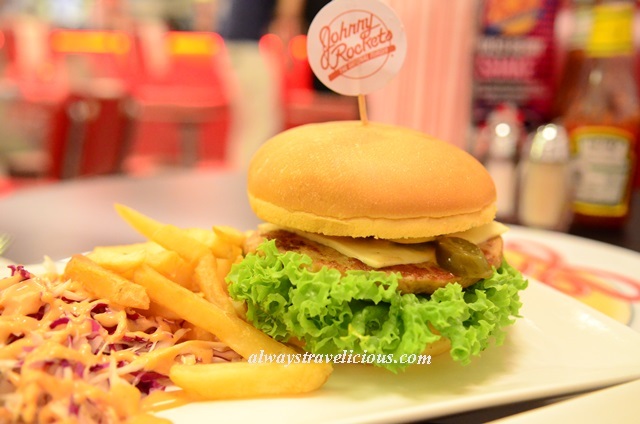 The burgers have very iconic names, such as the Route 66 (RM 24.90) and the Houston (RM 25.90). The burgers are available in both beef and chicken. The Route 66 is an appetizing giant with chicken patty, a pile of grilled mushroom, grilled onions and Swiss cheese, though the onions could have been grilled longer for a softer texture. The Houston is actually more or less the same as the above, but it has jalapeno peppers instead of mushrooms and onions. Kinda wished the patties were a little more gourmet but the entertaining atmosphere with a jiving bunch of staff makes up for it. Address : various outlets in Avenue K KL, The Curve PJ, Paviliion KL, Sunway Pyramid PJ and KLIA 2 Sepang. Sadly not a fan of the food here at all and I shall be a Themed Dining Grinch and say that the dining experience at this joint is worsened by all that incessant jiving. I can’t concentrate on the flavours at all – and I suspect that this may actually be the management’s hidden intention as the said ‘flavours’ are really not worth writing home about. The only saving grace of this establishment is the attentive (if overworked) staff who not only have to serve graciously but keep afoot with all that toe-tapping. I feel sorry for them and they should be paid a wait staff salary AND a dancer’s fee. That sounds like a conspiracy theory there ! 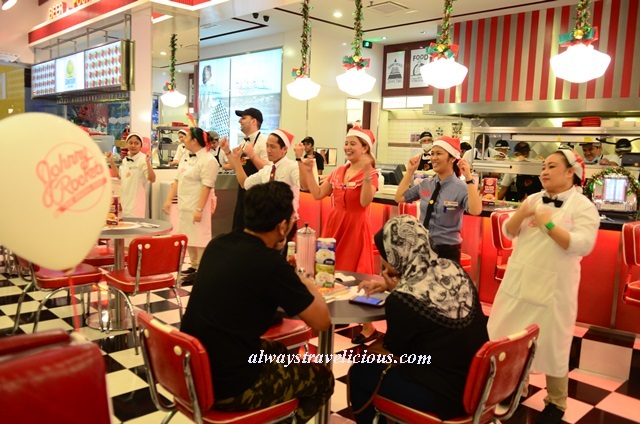 The atmosphere definitely is top notch very classic with all the dances and all American, it outshines the food actually~ It’s not easy being a waitress these days, you gotta serve and dance too. They danced pretty well too.